Originally published in NANO Fiction (Fall 2012). She maneuvered the boy into a gentle break-up while standing in line for a motion picture. Which motion picture? She blinks her eyes. The knowledge has flown. She remembers the boy as an oddment, a curiosity, in the way that one might recall a well-meant gift. She remembers his face. Its hope, its fleshiness. Had they quarreled? The question drifts in light. She recalls the quiet aftermath: how she and he had resumed their wait in line as if nothing had happened. Bought tickets, gone in. Found seats, presumably. Again waiting: for the sumptuous curtains to part, the reels to clatter and spin. Then a first scrap of film: incised with wild markings, light-dark. Like a howl, she wants to say. Scott Garson is the author of American Gymnopédies, a collection of microfictions (Lit Pub Books, 2012). He has stories in or coming from The Kenyon Review, American Short Fiction, Hobart, Conjunctions, New York Tyrant, Bat City Review, Threepenny Review, and others. He edits Wigleaf. 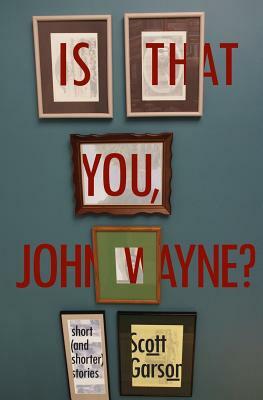 Scott’s collection of stories is called IS THAT YOU, JOHN WAYNE?